Today, both radioactive SPECT and PET imaging radiopharmaceuticals are used for clinical diagnosis of bacterial infections. Due to the possible applications in image-guided surgery, fluorescent imaging of infections has gained interest. We here present the highlights and recent developments in the use of fluorescence imaging for bacterial infections. In this overview, we also include the latest developments in multimodal bacterial imaging strategies that combine radioactive and fluorescent imaging. Based on this literature, we present our future perspectives for the field including the translational potential. In the current review, we complement earlier reports with the most recent fluorescent and multimodal radiopharmaceuticals for bacterial infection imaging. Where possible, in this review, the chemical structure of the compounds and clinical images were shown. 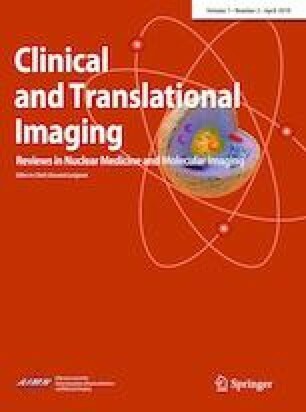 A total of 35 out of 77 original articles on pre-clinical and clinical imaging of bacterial infections with fluorescent tracers and multimodality radiopharmaceuticals were included for reviewing. In our view, the highest translational potential lies with compounds that are based on targeting vectors that are specific for bacteria: e.g., fluorescently labelled UBI29–41, polymyxin B, vancomycin, ZnDPA and a M. tuberculosis-specific β-lactamase-cleavable linker CNIP800. 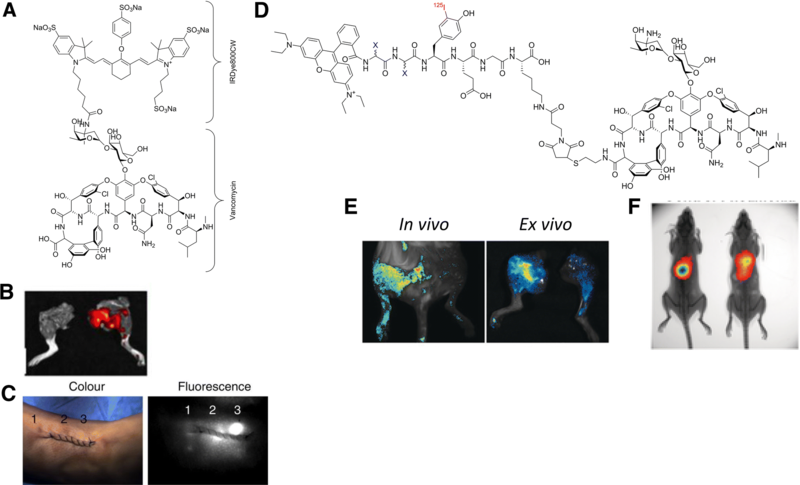 Multimodal concepts using dually labelled UBI29–41, vancomycin, and ZnDPA help connect optical imaging to the more traditional use of radiopharmaceuticals in infectious diseases. Multimodal bacterial imaging is a promising strategy not only to diagnose bacterial infections but also to evaluate the effectivity of surgical treatment for infections. Radiological imaging using computed tomography (CT), magnetic resonance imaging (MRI), X-ray, and/or ultrasound is often employed to localize the infection site and to provide a roadmap for tissue sampling and removal . These imaging techniques, unfortunately, are not specific; they detect anatomical abnormalities in tissues and organs that occur as a result of infection or inflammatory responses caused by other diseases . Reliable differentiation between infection and other pathologies is paramount, not only for the diagnostic process but also during therapeutic interventions. To accommodate such needs, significant efforts have been made to realize molecular imaging in the area of infectious diseases [3, 4]. Tracer developments have predominantly focused on radiopharmaceuticals (recently reviewed in [5, 6, 7, 8]) and on fluorescent approaches. Optical imaging of bacterial infections in vivo is emerging . Such imaging can occur either using endogenous , genetically encoded luciferase or green fluorescent protein  or using exogenous fluorescent tracers that target and/or illuminate bacteria [6, 7, 12, 13]. As summarized in Table 1, the latter group of tracers can be divided for different families of molecules. In the current review, we complement earlier reports [6, 7, 12, 13] with the most recent fluorescent and multimodal radiopharmaceuticals for bacterial infection imaging. Where possible, the chemical structure of the compounds and clinical images were shown. In addition, we provide some future perspectives for the field. Bacterial endogenous imaging has been introduced and validated as a diagnostic method for detection of bacterial wound colonization or clinical wound infections . Bacteria can be visualized in real time in tissues using a handheld imaging device that emits a low-intensity violet light (405 nm) that excites bacteria fluorescent either with red or cyan. A case series was described by Hill et al. where they applied the detection of the endogenous fluorescence of bacteria themselves in infected superficial wounds of seven patients . An excitation (UV) light source of 405 nm on superficial wounds of patients yielded a green fluorescent signal in collagen-containing tissue, a red fluorescent signal for porphyrin-producing bacteria (e.g., S. aureus) and a cyan fluorescent signal for pyoverdine-producing bacteria (e.g., P. aeruginosa) (Fig. 1). The authors illustrated the potential benefits of using this technique in open wounds, where it may assist the clinicians in confirmation whether a wound is infected at the bedside, accurate sampling of the wounds, and in treatment monitoring . This detection method, despite having the advantage of being independent of the use of exogenous tracers, is limited to bacteria that produces fluorescent molecules on the surface and subsurface of the skin. The detection limit of this method mainly depends on the number of bacteria present in the wounds. A potentially valuable secondary side effect of this technology could be that the UV light used to excite the endogenous fluorophores, potentially applies photodynamic therapy to the bacteria . Positively charged zinc(II)-dipicolylamine (ZnDPA) analogues that electrostatically interacts with negatively charged bacterial surfaces were used for radioactive or fluorescence imaging bacterial infections (Table 1) . A multimodal ZNDPA approach described an 111In-based compound, consisting of 111In-DOTA-biotin/SA/biotin-ZnDPA (biotinylated ZnDPA and the biotinylated chelator DOTA were linked through streptavidin, exact chemical structure unknown). This is not a hybrid radiopharmaceutical, but it was co-injected in mice with a fluorophore (PSVue®794)-conjugated ZnDPA analogue (Fig. 2a) as a cocktail at 3 h after infection/inflammation. This approach allowed for both SPECT and optical imaging . Imaging with the two compounds combined, discriminated well between bacterial infections and LPS-induced sterile inflammations (Fig. 2b, c). Both the fluorescence and SPECT images showed obvious accumulation in the S. pyogenes-infected thigh muscle in both models at 1, 4, and 22 h after injection. At 22 h, the average ratio between infection and control muscle for the radioactive compound was 2.8 (number of bacteria unknown). This ratio was significantly (p < 0.01) higher compared to the ratio between LPS-induced sterile inflammations and control muscle, i.e., 1.0. A general limitation of the positively charged ZnDPA is its binding to negatively charged membranes of apoptotic and necrotic mammalian cells, which also makes ZnDPA a marker for the apoptosis/necrosis created by the infection . Antimicrobial peptides (AMPs) were designed to rapidly kill a broad spectrum of pathogens, including Gram-positive and Gram-negative bacteria, fungi, parasites, and even enveloped viruses . In low quantities, however, radiolabelled cationic AMPs have been successfully used for bacterial imaging. Cationic AMPs bind to negatively charged lipoteichoic acid, phospholipids, and lipopolysaccharides on bacterial membranes [34, 35]. The radiolabelled cationic antimicrobial peptide UBI29-41, has found its way into clinical SPECT and PET imaging of infections . The same peptide fragment can also be labelled with the near-infrared (NIR) dye ICG02 (Fig. 3a) and was used to image infections with various Gram-positive and Gram-negative bacteria in mice . A study with S. aureus demonstrated the tracer’s potential to identify muscles infected with bacteria (Fig. 3b); infection-to-noninfected tissue ratios increased to 5–6 for S. aureus at 6 h p.i., whereas the ratios decreased to almost 1.0 at 48 h. p.i. In another study, UBI29-41 was conjugated to 7-nitrobenz-2-oxa-1,3-diazol-4yl (NBD, Fig. 4a). This lipophilic fluorescent dye increases in brightness in a dose-dependent fashion upon insertion into the bacterial membrane (Fig. 4b) . The compound was used to detect bacteria in human lung bronchoalveolar lavage fluid and ex vivo in human lung tissue material using fibre-optic confocal fluorescence microscopy (Fig. 4b) . Although the autofluorescence of background tissue disturbed the sensitivity of imaging and increased the detection limit, initial results were promising for imaging bacteria in vivo. Another issue is the chance of proteolysis and oxidation of peptide-based tracers in vivo, and to reduce this complication, a cyclic analogue of the UBI peptide was included in the study as well (Fig. 4c). The imaging results were comparable with the linear variant of the tracer (Fig. 4b, d). 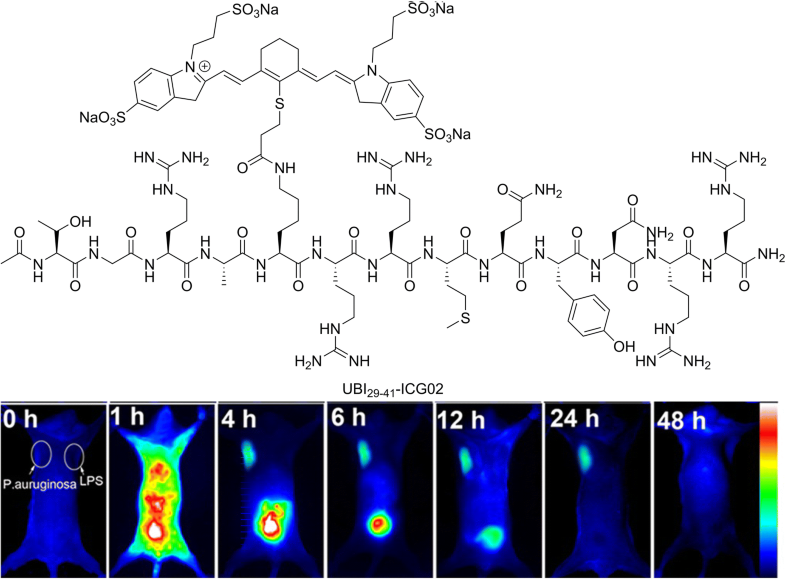 For multimodal imaging, a dual-labelled (radioactive and fluorescent) construct of the bacteria imaging radiopharmaceutical UBI29-41, 111In-DTPA-Cy5-UBI29–41 (Fig. 5a), was described . This radiopharmaceutical allowed radioactive and fluorescence imaging in experimental infections in mice (Fig. 5b). Radioactivity-based measurements yielded target-to-nontarget (T/NT) ratios of 2.82 ± 0.32 for S. aureus and 2.37 ± 0.05 for K. pneumoniae, while fluorescence-based measurements of the same compound yielded 2.38 ± 0.09 and 3.55 ± 0.31, respectively. As with many other infection imaging tracers, all labelled species of UBI29–41 are generic, meaning that they will bind to all types of bacteria; therefore, it cannot differentiate between various strains of pathogens. Fluorescent antibiotics have proven to be useful for studying cell wall synthesis  and bacterial resistance, examining toxicity, exploring the mode of action  as well as imaging of infections . Recently, Akram et al. presented a study that made use of an NBD-labelled cationic antimicrobial peptide antibiotic polymyxin B sulphate (PMX-NBD, Fig. 6a) —PMX-NBD binds to lipid A of the lipopolysaccharides in the outer membrane of Gram-negative bacteria . Using an in situ endomicroscopy set-up, the authors were able to specifically visualize Gram-negative bacteria in ex vivo ventilated ewes’ lungs (Fig. 6b). The same real-time imaging technique also proved to be efficient in distal lungs of six human bronchiectasis patients (Fig. 6c). Especially for pulmonary infections with Gram-negative bacteria, this imaging modality proved to be more specific and sensitive than the alternative bronchoalveolar lavage and bacterial culturing . A particularly interesting example is the use of fluorescein-labelled vancomycin (Fig. 7a). Vancomycin inhibits synthesis and assembly of the thick peptidoglycan layer in Gram-positive bacteria and is active against Gram-positive bacteria only. Therefore, it is a specific imaging agent restricted to only Gram-positive bacteria. In mice with S. aureus-infected thigh muscles, this tracer allowed discrimination between infections with Gram-positive and Gram-negative bacteria (E. coli). Also, discrimination of bacterial infection from sterile inflammation was assessed (Fig. 7b) . In a human post-mortem implant model, a tissue implant containing labelled bacteria was inserted subcutaneously and thereafter imaged. Clearly, spots containing fluorescent bacteria could be identified (Fig. 7c). The use of fluorescein-labelled vancomycin is limited by the inability to detect deep tissue infections because of scattering and absorption of photons by tissue. To overcome this limitation, a hybrid vancomycin-based radiopharmaceutical was introduced that contained the fluorescent dye rhodamine B as well as the radioisotope 125I (creating 125I-Rho-vancomycin) (Fig. 7d) . Mice were infected in the right thigh muscle with methicillin-resistant S. aureus (MRSA), whereas the contralateral thigh muscle was infected with E. coli reflecting the bias in labelling Gram-positive bacteria. Within 2 h after injection, 125I-Rho-vancomycin showed an 8.7-fold higher accumulation in MRSA-infected thigh muscles than in muscles infected with E. coli. (Fig. 7e). Fluorescence imaging revealed a 3.9-fold increase in uptake in MRSA-infected thigh muscles with 125I-Rho-vancomycin compared to control tissue (Fig. 7f). Imaging of pulmonary infections by MRSA with 125I-Rho-vancomycin yielded about 8.9- to 13.3-fold higher lung-to-background ratios than a control radiopharmaceutical (non-cell binding variant of 125I-Rho-vancomycin). This study underlines that 125I-Rho-vancomycin allows accumulation on bacterial membranes of Gram-positive bacteria. Recently, activatable fluorescent tracers show a promising development that allows fast and specific testing of the metabolic processes of specific strains of bacteria . These tracers allow detection of bacteria expressing nuclease, reductase or hydrolyse activities. Nucleases, which have widespread expression and diversity, are one category of enzymes that is expressed by various bacterial species capable of cleaving the phosphodiester bonds between nucleotides of nucleic acids which is of importance for many aspects in DNA repair . For imaging of micrococcal nuclease as produced by S. aureus , a substrate consisting of a short partially O-methyl-modified oligonucleotide (mC-mU-mC-mG-T-T-mC-mG-mU-mU-mC) flanked with a fluorescein amidite (FAM) or Cy5.5 fluorophore and ZEN™ fluorescence quencher (IDT DNA Technologies) (Fig. 8a) was used. Both tracers were activated in vitro upon enzymatic cleaving by 26 clinical S. aureus isolates but were resistant to serum nucleases. In a mouse model bearing S. aureus-induced muscle infection, both FAM and Cy5.5 substrates were injected intravenously and yielded activation by bacteria and allowed imaging of the infection (Fig. 8b) . Nitroreductases (NTR) are enzymes that allow bacteria to metabolise nitroaromatic compounds. These enzymes are expressed in most Gram-positive and Gram-negative bacterial strains . The self-quenched NIR dye CytoCy5S© (Fig. 9a) was intravenously injected and it was reported to generate a signal that allowed detection of 5 × 106 viable S. typhimurium in experimental thigh muscle infections in mice as well as in the same model of infection with 5 × 106 viable E. coli . As the bacteria used in these studies were engineered to be luminescent, this allowed for imaging using both bioluminescence and fluorescence. As certain tumours also express NTR, these fluorogenic NTR substrates can also be used for imaging of tumours [49, 50]. As nitroreductases are also expressed in eukaryotic cells, for imaging of infections this may increase the background activity. For the detection of pulmonary M. tuberculosis infections, β-lactamase-activatable tracers can be applied as an activatable ligand for bacterial enzymes [6, 25]. A NIR reporter enzyme fluorogenic substrate for β-lactamase (CNIR5, Fig. 10a) consists of a fluorescent dye IRDye800CW and a fluorescence quencher (QC-1) linked to each other via a M. tuberculosis-specific β-lactamase-cleavable linker  that is quenched by Förster resonance energy transfer (FRET) with the quencher molecule and becomes fluorescent after cleavage of the β-lactam ring by intracellular M. tuberculosis, separating the quencher from the dye and thus cancelling the FRET (Fig. 10b). This approach allowed for the detection of viable M. tuberculosis in the lungs of mice using NIR tracer CNIR800 (Fig. 10c) [25, 51, 52]. 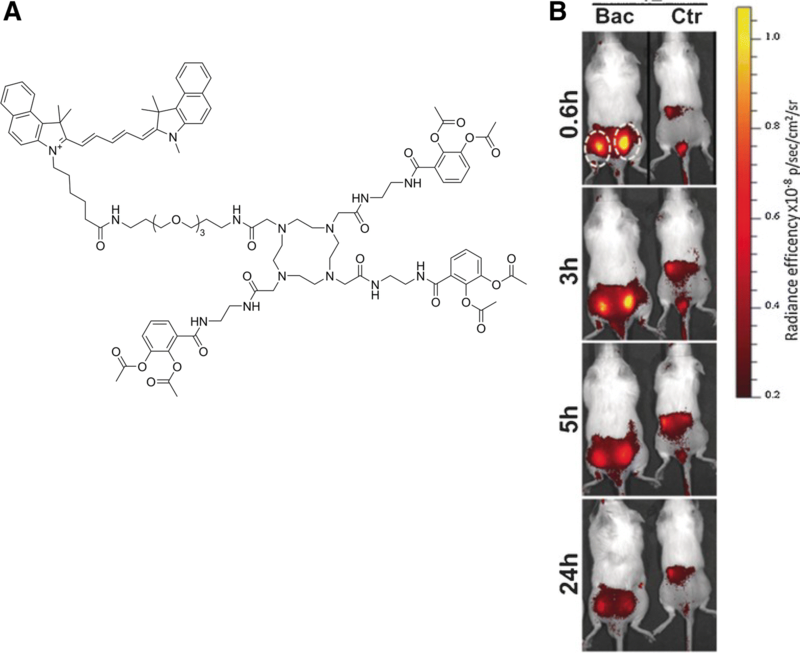 The advantage of enzyme-activatable tracers is that it has potency in imaging of infections with drug-resistant bacteria . Bacteria cell walls and membranes contains various proteins that are essential for maintenance of their external structure and integrity. As some of these proteins are solely expressed by bacteria, they are of interest in targeting by fluorescent tracers. The carbohydrate-binding protein (lectin) concanavalin A, has a high affinity for mannose residues present in bacterial cell walls. The plant-derived lectin concanavalin A binds α-d-mannosyl and α-d-glucosyl residues of B-glycans. 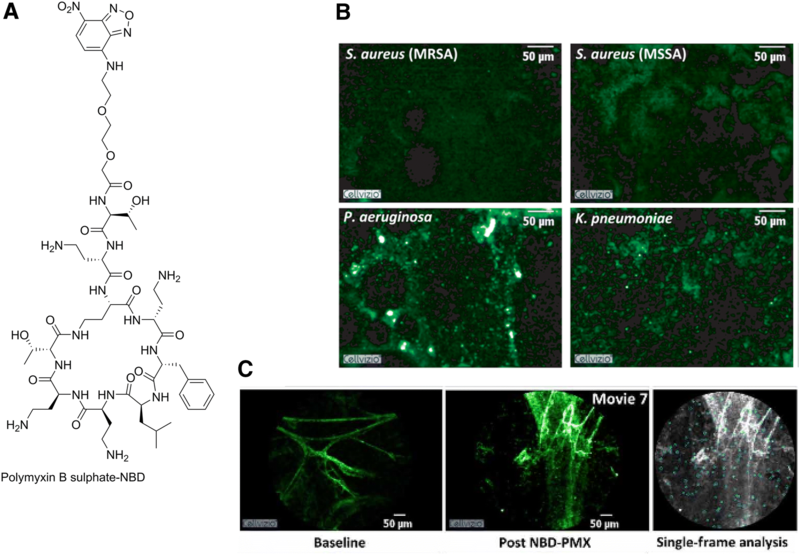 When concanavalin A was conjugated to poly(N-isopropylacrylamide microspheres PNIPAM-co-St which were functionalised with the NIR dye IR750 (chemical structure unknown) , this compound has shown to allow for imaging in a murine wound and catheter infection model with S. aureus. Following topical application and washing in live mice, the tracer rapidly displayed the presence of bacteria in the wounds and catheters already from 2 × 106 viable bacteria with the infection-to-background ratios ranging between 2 and 5. Unfortunately, concanavalin A interacts with all mannose-containing proteins and receptors,  e.g., those present in erythrocytes and various cancer cells [54, 55]. Siderophores, consisting of metal-chelating peptides, are low-molecular mass iron binders transported by most bacteria, fungi, and some plants . Because bacteria require iron for their metabolism and growth, uptake of iron was via siderophores, and the labelled siderophores will lead to labelled bacteria. Ferreira et al. demonstrated that siderophore–Cy5.5 conjugates (Fig. 11a) yielded different intensities in uptake in various bacterial species. This was related to differences in iron transportation by various species of bacteria with different growth phases and metabolism. 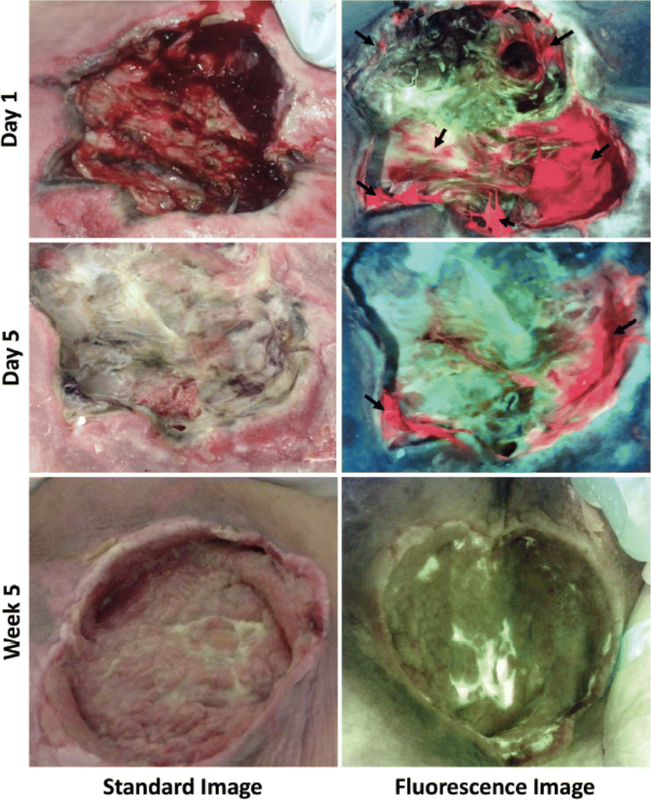 In vivo fluorescence imaging of P. aeruginosa skin infections (in mice) showed imaging of infections with the highest intensity at 0.6 h after injection of the tracer (Fig. 11b) . At later intervals until 24 h p.i., the fluorescence signal decreased. In control mice injected with a tracer lacking the catechol (siderophore) moiety, because of clearance, the fluorescent signal was only noted in the kidneys (Fig. 11b). Kim et al. 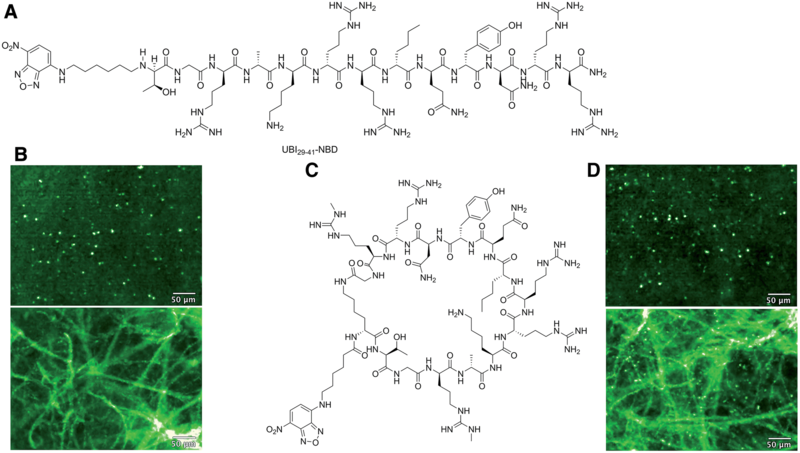 discovered a fluorescent tracer that binds to fibrils that are part of the bacterial biofilm matrix [58, 59] together with extracellular polymeric substances like DNA, proteins and polysaccharides . Biofilm-associated infections like prosthetic joint infections or chronic osteomyelitis are very difficult to treat, because the biofilm protects bacteria against the host immune response and a subpopulation of bacteria residing in the biofilm switch to a dormant state. Biofilm-penetrating tracers are of interest in the detection of persistent and chronically infected tissues and implants and may serve as an alternative for tracers that cannot pass the biofilm and thus fails in targeting bacteria. The boron-dipyrromethene (BODIPY)-based fluorescent compound called CDy11, was obtained by screening for functional binding to bacterial biofilms in vitro (Fig. 12a). Although this tracer is not targeted against the bacteria themselves and requires a formed biofilm to show binding, the authors showed that the tracer in a corneal infection model accumulated in fibril-like structures in biofilms of bacterially infected eyes (Fig. 12b). Differentiation between infectious and non-infectious causes of inflammatory processes is of crucial importance for clinicians. For this purpose, progress has been directed towards specific targeting of pathogens. In the current review, we updated earlier reviews with new findings on fluorescent and even multimodal radiopharmaceuticals for imaging of bacterial infections. Fluorescence imaging alone holds particular promise for the inspection of human body surfaces of, e.g., surgical wounds [12, 13]. 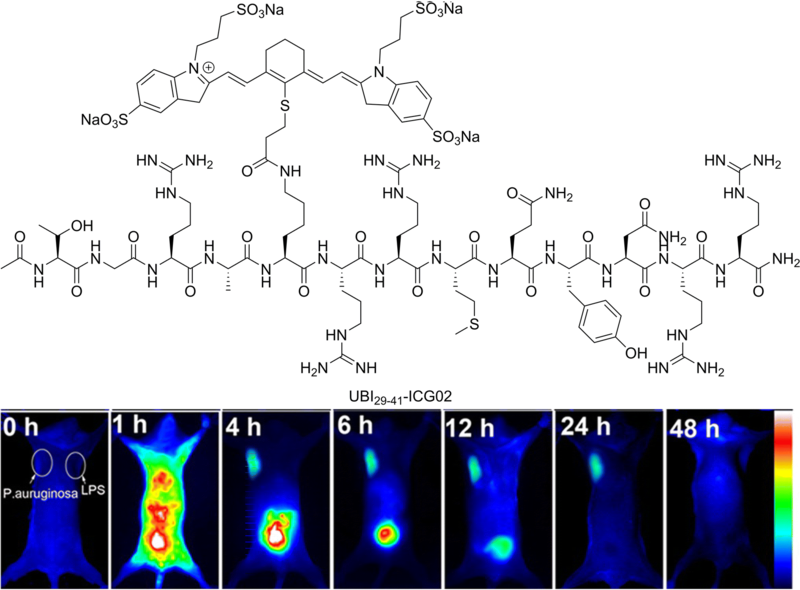 Hybrid radiopharmaceutical analogues, on the other hand, provide outcome and help connect fluorescence tracers with their translationally more advanced radionuclear counterparts. With hybrid radiopharmaceuticals, the radioactive imaging is the best total body-imaging modality for detecting and localizing deep infections, whereas fluorescence imaging allows real-time imaging and has a high spatial resolution [61, 62]. This innovative concept has already been applied in oncological surgery where it provides full-body nuclear imaging to roughly locate the lesions and aids the surgeon during inspection of the primary tumour and searching for microscopical metastasis guided by a fluorescent signal [63, 64, 65, 66, 67]. In imaging of infections, there is a need to combine nuclear and optical imaging radiopharmaceuticals as well as ideally, one single dual-modal compound could be administered to (i) assess total disease and infection burden using nuclear imaging techniques, followed by (ii) identification of the extent of the infection, and prevention of sampling errors. For example, in wound and trauma surgery, infections often occurs and in this respect, the optical modality can be used to visualize the localization of the bacteria and thus facilitates complete resection during surgical debridement of infected areas. A similar approach is feasible, after a surgical intervention and inspection, persistent infections of transplants can be detected using the visual signal. Such a dual-modal compound could be especially attractive to minimize patient burden and healthcare costs; as imaging is immediately followed by image-guided surgery within a short time frame, it can accelerate improvement of health status and costs on healthcare. Recent data shows that bacterial imaging is slowly finding its way into ex vivo human applications. As this type of progression is similar to what has been observed for infection-specific radiopharmaceuticals , this illustrates that fluorescence-based bacterial imaging is also steadily moving towards medical implementation and can ultimately be used for guiding surgical interventions. Tissue attenuation, e.g., absorption of scattering of the light is a restrictive factor during the pharmacological evaluation of fluorescent tracers. Although it is known that fluorescent labels can influence tracer pharmacokinetics [69, 70], this effect cannot be quantified without having a radioisotope for quantitative imaging/biodistribution assessments. Next to the traditional use of organic dyes, inorganic dyes may also be used in the future as these may differ in pharmacokinetics or the number of attached reporter groups. The introduction of inorganic medicinal chemistry is making rapid progress, with enormous impact, e.g., with platinum-based compounds in antitumor chemotherapy, and iron oxides and gadolinium(III) compounds in MRI contrast agents for noninvasive diagnostics . Several transition metal complexes (in particular those with ruthenium(II)) have been explored for targeted fluorescent imaging , including lifetime imaging [73-76]. Uniquely, these inorganic dyes may also support theranostic applications due to their ability to create reactive singlet oxygen [75, 77]. Within the context of multimodal imaging, it is interesting to note that transition metal ions such as ruthenium can also be replaced with radioactive isotopes, e.g., 97Ru , further extending the scope of inorganic medicinal compounds in which, uniquely, one and the same metal ion could act as the photophysically and/or photochemically active centre, as well as the radioactive nuclide for tracing or therapy. Importantly, combining multiple properties into a single molecular (sub)unit, dramatically alleviates the negative effects of multiple bulky molecular sub-units on targeting and uptake properties. Developments in imaging of bacterial infections with fluorescent, radioactive  or multimodality radiopharmaceuticals are still in progress and besides generic tracers that can image the site of infections, improvements in sensitivity were also made that allows to assess the bacterial burden. Also, imaging of specific bacterial strains can be very helpful as a tool for imaging of pathogens in environments which colonized with other bacteria as in the gut or the lungs. In our view, the highest translational potential lies with tracers that are based on targeting vectors that are specific for bacteria: e.g., fluorescently labelled UBI29–41, polymyxin B, vancomycin, ZnDPA and a M. tuberculosis-specific β-lactamase-cleavable linker CNIP800. 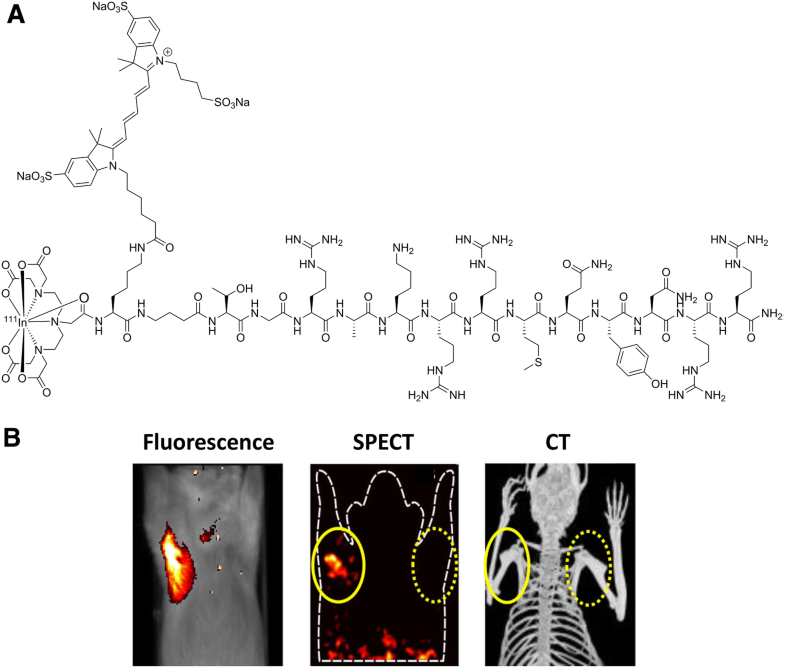 Multimodal concepts using dually labelled UBI29–41, vancomycin, and ZnDPA help connect optical imaging to the more traditional use of radiopharmaceuticals in infectious diseases. Multimodal bacterial imaging is a promising strategy not only to diagnose bacterial infections but also to evaluate the effectivity of surgical treatment for infections. Although the recent developments are promising regarding imaging of specific bacterial species (Gram-positive or Gram-negative strains), it must be considered that bacterial imaging tracers as we described in this review cannot discriminate between antibiotic-sensitive or -resistant bacterial strains. Therefore, further research in exploiting molecular targets may support the discrimination between bacterial species and those that are unique to resistance properties. Altogether, pre-clinical development and evaluation of dual-labelled bacteria imaging radiopharmaceuticals for SPECT/PET and optical imaging is still in progress and the first results shows great promise, but as for every new compound, further studies concerning specificity, sensitivity, and safety assessments including toxicity and dosimetry are required. The research leading to these results was funded with grants from the Netherlands Organization for Scientific Research (VIDI Grant—STW BGT11272 to F. W. B. van Leeuwen and 864.10.003 to Wiep Klaas Smits), Meta Roestenberg was supported by a VENI Grant from ZONMW and a Gisela Thier fellowship from the LUMC. In the selected clinical literature manuscripts were only included when all procedures followed were in accordance with the ethical standards of the responsible committee on human experimentation (institutional and national) and with the Helsinki Declaration of 1975, as revised in 2008. Informed consent was obtained from all patients for being included in these studies.